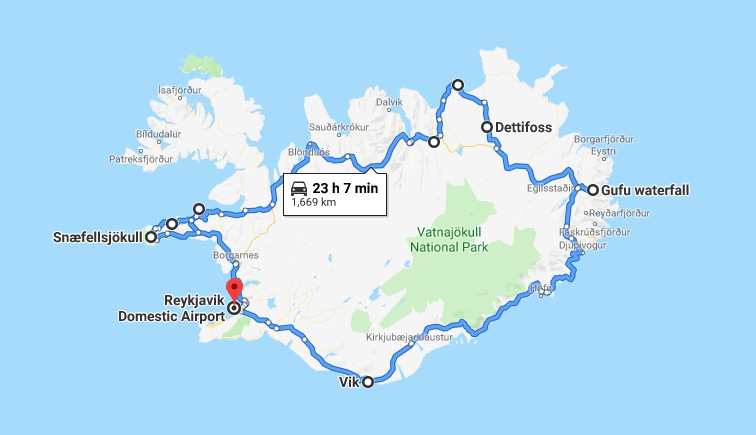 We landed in Reykjavík at 7:00 am with an ambitious goal to drive four hours north to the peninsula, complete with jetlag and loads of caffeine. We made it halfway there before we stopped at a roadside pullout for a lengthy nap. Afterwards, we checked into the Fosshotel in Stykkishólmur and toured the Snaefellsjökull national park between the hours of 11pm and 2am thanks to 24 hours of daylight and open park access. Despite the predicted rain while we packed for the trip, this first day was the only time it rained on us. Because of the rain and our lack of energy, the cliffs near Arnarstapi and Djúpalónssandur beach were the only place we took solely took photos with our photos, rather than the DSLSR (so bear with me through a few grainy photos). The cliffs were beautiful and I couldn’t have stayed to listen to the waves crashing below us for hours, but we had more sights to see. Djúpalónssandur beach was the next stop and our first beach of the trip. 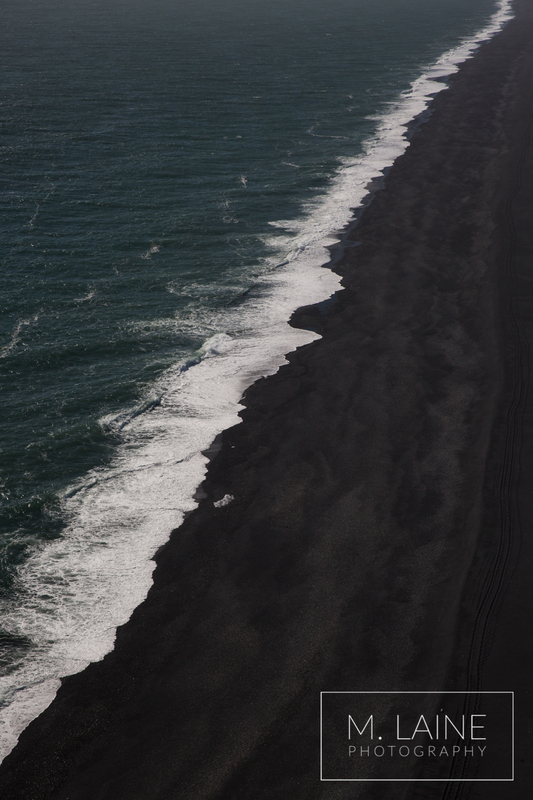 I loved its sand made of black lava rock, as most of Iceland’s beaches are. It was here that we quickly learned of Icelander’s respect for their landscape, fisherman, and Icelandic rescue teams. Lava rock surrounded the beach and, prior to the trip, I read that visitors should not climb the rocks surrounding this beach because they’re home to fairies. Yep. Fairies. 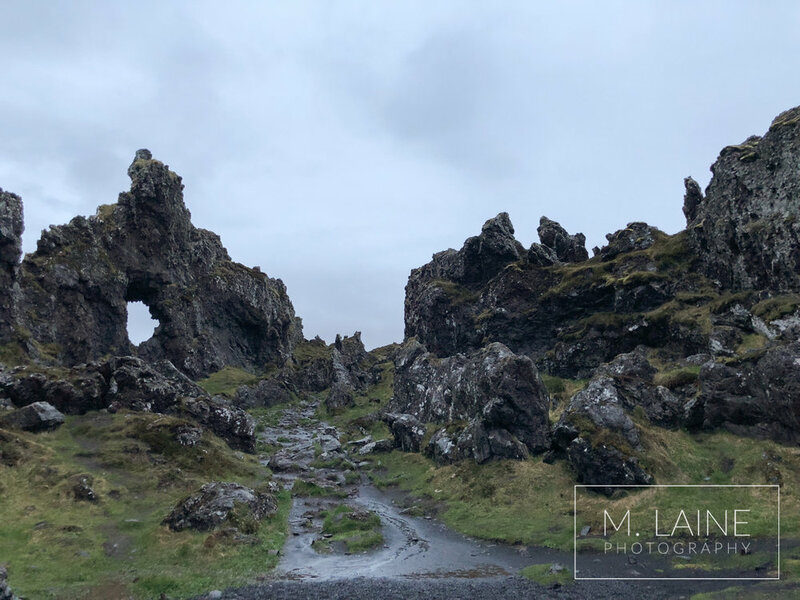 Approximately 50% of Icelanders believe fairies live in the lava rock throughout Iceland, so much so that they’ve rerouted roads and buildings for them. Whether they exist or not, the belief works well to keep their lands untouched. Icelanders also have a deep respect for their fishermen. 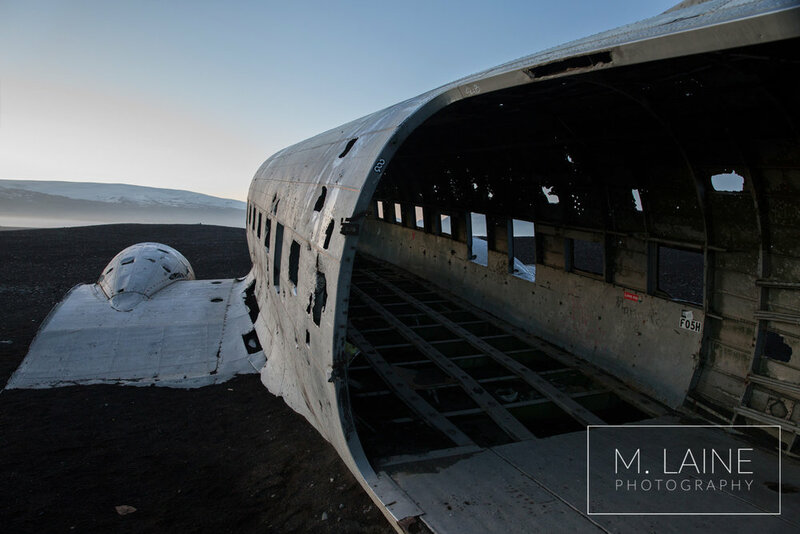 There are shipwrecks located across Iceland, and many have crashed near Djúpalónssandur beach. As a sign of respect, you’re not to touch the wreckage as it is kept there in memory of the brave fisherman who lost their lives there. As a sign of the ocean’s strength here, this was one of the few beaches we saw that had warning signs out to watch for sneaker waves, although they happen on most Icelandic beaches. Sneaker waves are large waves that come in suddenly, often without detection before they crash on shore and take unsuspecting beachgoers out to sea. Never turn your back on the ocean in Iceland! We also tried out the beach’s lifting stones. Back in the day, to be eligible as an oarsman, one had to be able to lift the second largest stone, although most oarsmen could lift the largest. Kirkjufellsfoss was one of Zach’s “must-see” locations of the trip. By the time we rounded the Peninsula and arrived here, it was after 1:00 am. 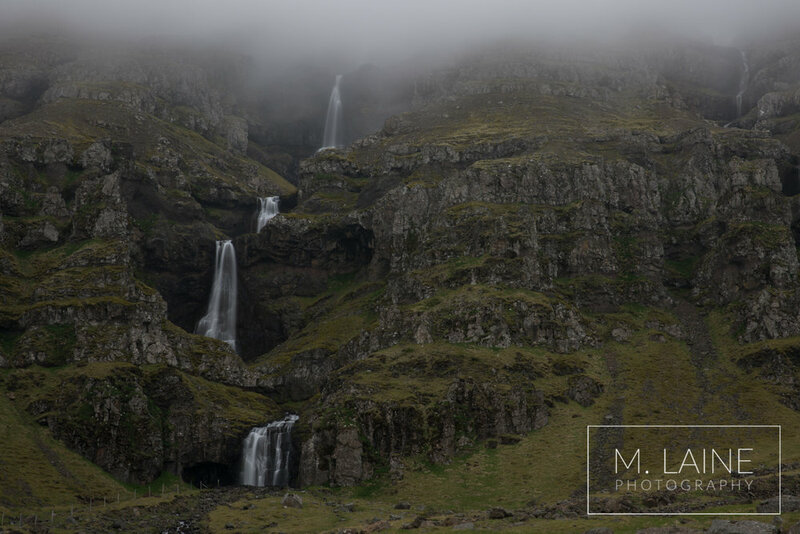 The rain had barely stopped, and clouds cleared to reveal the famous mountain and waterfall duo for us to photograph with the DSLR. Just as we finished up, clouds overtook the mountain. After all of that, we had only completed our first 24 hours in Iceland! The next day, we drove five and a half hours north to the Breidamyri Farm Guesthouse. We experienced our first F-Road of the trip, which are gravel or dirt roads that require 4x4 vehicles, and generally don’t have bridges over river crossings. Zach questioned the 80kph (50mph) speed limit on the gravel road, while locals passed us going much faster. Of all the F-Roads we drove on after, this one was the nicest, with very few potholes and no water crossings! We passed through one of our favorite towns of the entire trip — Akureyri, which was the most gorgeous and affluent farming town I’ve ever seen. I made Zach stop at every possible pull-out for photos! 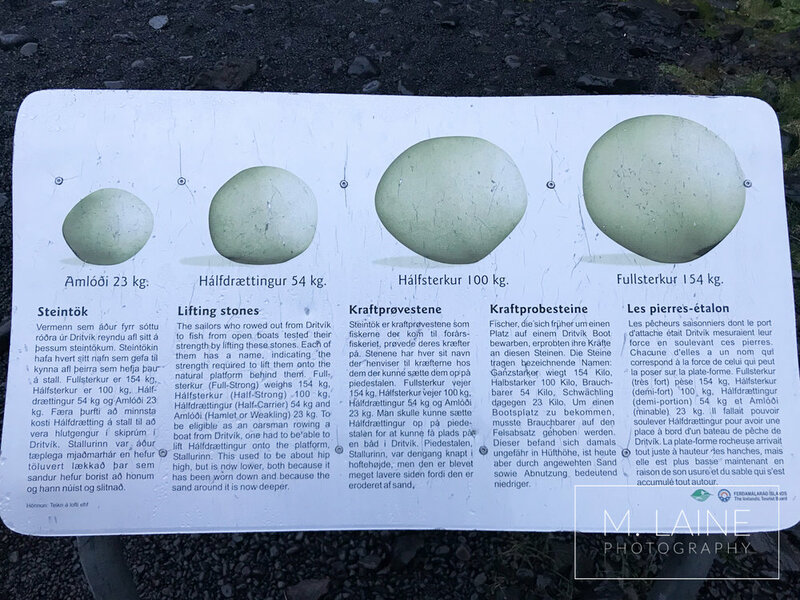 On the drive, we also noticed that Iceland marked their road signs with pictures to explain what was coming up, such as lodging, public restrooms, and, what we got excited about, places of interest. As soon as we figured out what each symbol meant, we stopped at the next sign that said it was a place of interest. There were mounds of lava rock everywhere, and we thought we were about to learn about a geological event that shaped the landscape, or at least interesting cultural history. Zach pulled up to the sign and squinted to read it aloud saying, “This is where Iceland’s last public execution took place.” What!? We looked at each other in disbelief and did not stop at another place of interest for the rest of the trip! When we arrived at our last destination of the day, the famous waterfall Godafoss, we both loved it. The waterfall was so wide that we couldn’t fit the entire length of it in one photo, but my favorite part was finding the path that went down to a small beach. Dinner that night was at the nearest restaurant to the guesthouse, Dalakofinn Útibú which also doubled as a grocery store and gas station. It was our first multi-purpose restaurant of the trip. Zach had seafood pizza and said it was great! Our third day in Iceland was another lengthy five-hour drive, complete with our spontaneous and planned detours. The first stop of the day was at Dettisfoss and Selfoss (if you haven’t caught on yet, “foss” means waterfall in Icelandic). We pulled into the parking lot and heard the rumble of a waterfall one kilometer away and assumed it was Dettifoss, since it’s the larger falls of the two. We decided to walk there first, since we were most excited to see it. About halfway to Dettifoss, the sound changed to an intimidating and DEEP roar, and we knew we had only heard Selfoss before. My jaw dropped at the sight of Dettifoss. It’s massive, and the amount of water going over it is insane to look at. According to Inspired by Iceland, 500 cubic meters of water drops 45 meters down into the surrounding canyon every second. 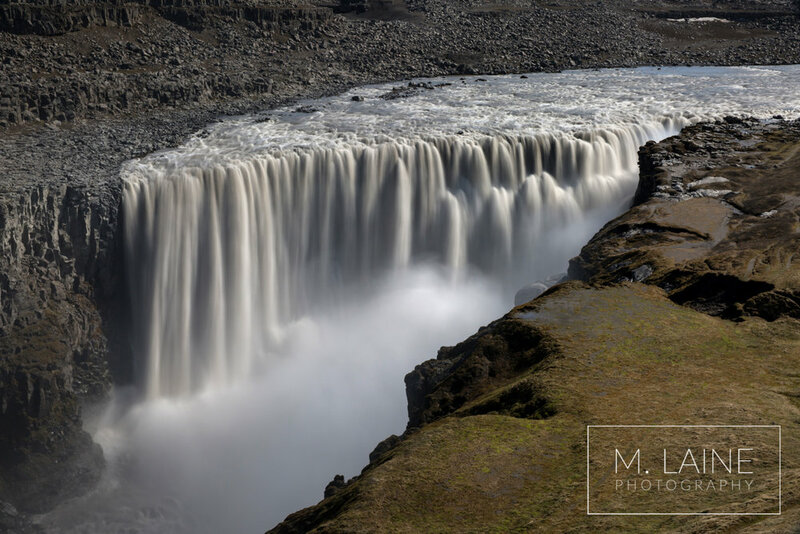 It’s wider than the length of a football field, and is nicknamed ‘the beast,’ known more for its power, than looks, unlike Godafoss, which is called ‘the beauty’. The paths nearest to Dettifoss were closed, so it’s hard to tell its scale, but if you look closely, you can see a few steps and path to the right of the falls. If there would have been people on the paths, they would have looked miniscule! Our view of Selfoss would have been more impressive from the other side of the river, but roads were closed on that side coming from the North, which we found out the hard way. Thankfully, the road across the river was already open for the season, but if we hadn’t found it we would have had to add another 3 hours to our drive. We enjoyed wandering on the rocks near Selfoss regardless, and it was hard to imagine that water could overtake where we stood in other seasons. We didn’t get any closer to the falls than these photos due to possible flash floods. After this stop, we drove three hours across an other-worldly landscape. I enjoyed stopping to stretch, and Zach’s biggest thrill was finding a “wild” chair atop a viewpoint. Gufufoss was our next unplanned stop of the trip. We knew it would add an hour to our drive and I was hoping it would pay off in views. It did. We drove up a beautiful and steep mountain pass, and and followed a river that led us to Gufufoss. Since this waterfall is off the beaten path, we had it to ourselves, and this was my favorite drive of the entire trip. Zach was thankful we weren’t driving the pass in winter conditions because, on our way back down, we noticed there were hardly any guardrails, despite the steep grade. We stopped for dinner in Egilsstaðir. Despite being Iceland’s largest town in the eastern region, the Skálin Diner was the only restaurant open for the season. It was a 50’s-themed American diner/ice cream parlor/gas station and it was interesting to see how the American theme was adopted in Iceland. That night we stayed in what Trip Advisor says is one of the most romantic hotels in Iceland – the Fosshotel Eastfjords. It was adorable, and we loved the beautiful view of the fjord from our room and the hotel’s dock. Day four was spent driving to the Fosshotel Núpar. We stopped at Jökulsárlón, the glacier lagoon, first. 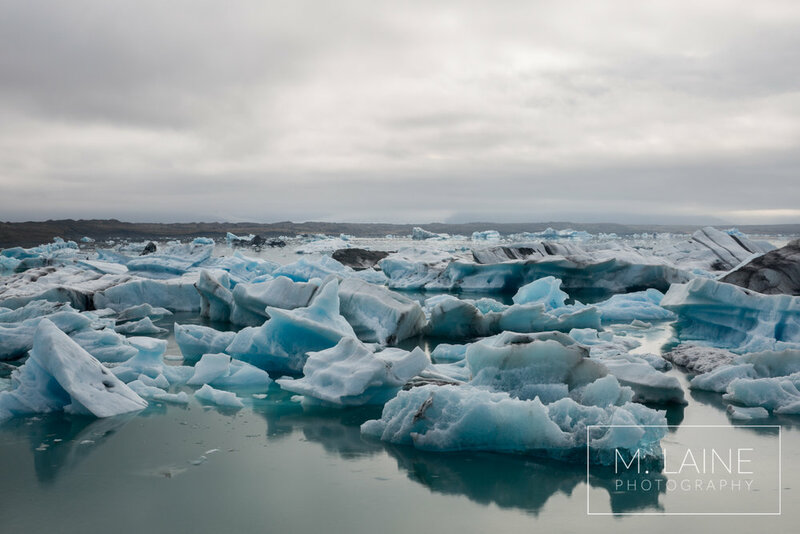 I’ve dreamt of visiting Jökulsárlón since I was a kid, so by the time I got out of the car, I was jumping for joy. Zach walked (I practically ran) up the hill above the lagoon first, and then walked down close to the water’s edge. The glaciers were equally beautiful and impressive, and Zach nearly had to drag me away. We stopped at Diamond Beach on our way out, but the tide was in and had washed away nearly all remaining ice. I did pick up my first ever piece of glacier, though! We planned on viewing Vestrahorn from the Stokkness peninsula as our next big stop, but fog hung heavy and low. Slightly disappointed, we agreed that this view would have to happen on another trip. Seeing the Sólheimajökull glacier from the road lifted our spirits, though. Even though we were far away, it still looked massive and popped up around every bend. The southern region of Iceland is full of viewpoints, and therefore tourists as well. 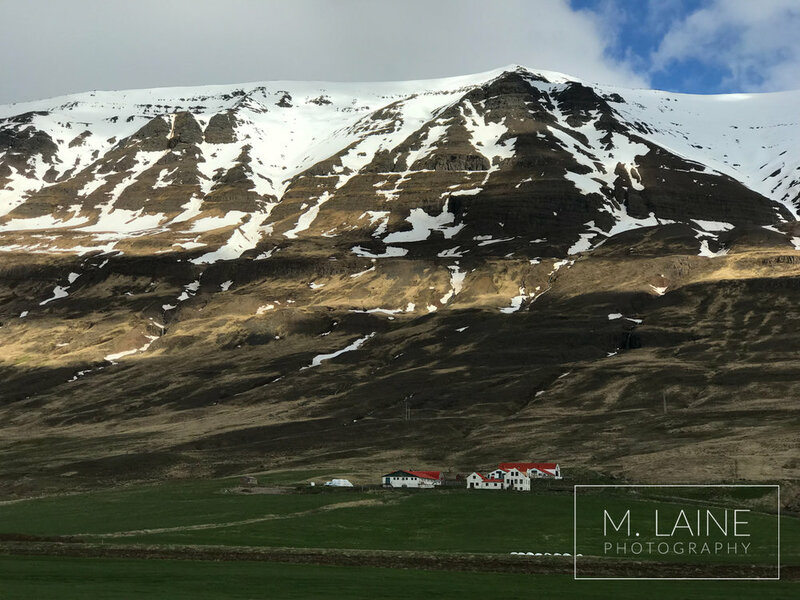 We were thankful to be there during the less crowded shoulder season, and since we chose to go clockwise around the Ring Road, we experienced the rural and less westernized parts of Iceland first. It was in here in the South that we started noticing an American influence, like bathrooms being larger, menus in English, and it being populated enough that restaurants were separate from the local gas stations. Fjaðrárgljúfur Canyon was on my list of “must-see” sights, but it was closed for trail restoration when we were there. To see this famous sight, we’ll have to come back during summer. Instead, we visited the Dyrhólaey Lighthouse and Reynisfjara beach. At the cliffs near the lighthouse, we experienced what wind in Iceland is like for the first time. It was strong, cold, and made me believe that it really could rip your car door off as we had been warned at the rental agency. I loved learning the myths about Reynisfjara beach — the rocks in the water are said to be trolls! They went to help a fishing boat during a storm one night, but didn’t make it back to shore in time and were turned to stone as the sun rose. We spent the night at The Garage, a guesthouse on a farm and my favorite accommodation of the trip. The owners had converted their old farm garage and cow house to accommodate visitors. Their sheep were right outside our window. We were told that they love to be fed bread in the morning, and if they heard a plastic bag, they’d come running. No need for noise from a plastic bag to get their attention, though. When I opened the curtain the next morning, I was greeted by their whole adorable (but slightly intimidating) herd staring at me! There is so much to see in the South, and we knew we’d be tired of long drives by this point in the trip, so we booked our stay at The Garage for two nights. 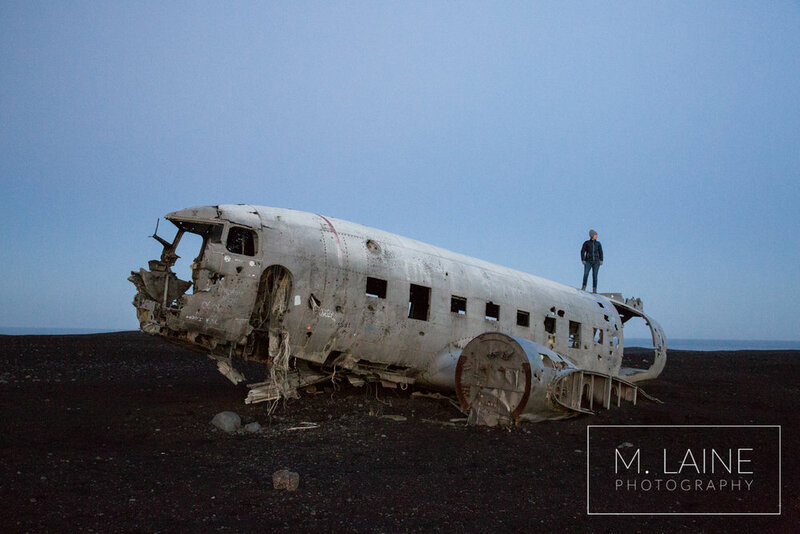 We took advantage of not having an early checkout the next morning by taking an evening nap and waking up at 11pm to visit Skogafoss and the Solheimasandur plane wreck without crowds. 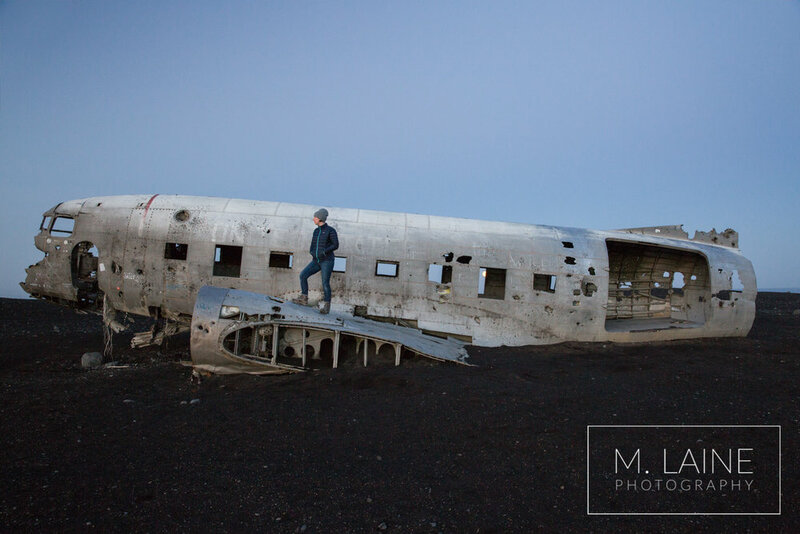 Our hosts said that they do not understand why Americans love visiting the plane wreck. It was funny to hear that because we thought it looked exotic and neat, but after experiencing so much natural beauty in Iceland, it was easy to understand why the locals wouldn’t consider it one of their better attractions. The plane wreck itself happened because of a simple mistake. The pilot made an emergency crash-landing on the beach after thinking they had run out of fuel, but really, he had just switched to the wrong fuel tank. Thankfully, no one was injured in the crash. Since we visited late, we had this popular sight to ourselves. On our walk to the plane an arctic fox walked up on us! Sadly, we could tell it wanted us to give it food but it was too skittish to let us get a camera out. Seeing it was the highlight of the night. My hope for our second day in the south was to visit and hike around Thórsmörk. Unfortunately, that didn’t end up happening due to the limited amount of buses scheduled (the downside of visiting during shoulder season) and wanting to maximize our time. To get there, you must take a tour, ride a bus, or be willing to ford a river, assuming your rental agreement allows that (our SUV wouldn’t have made it). We chose to tour the local waterfalls instead. 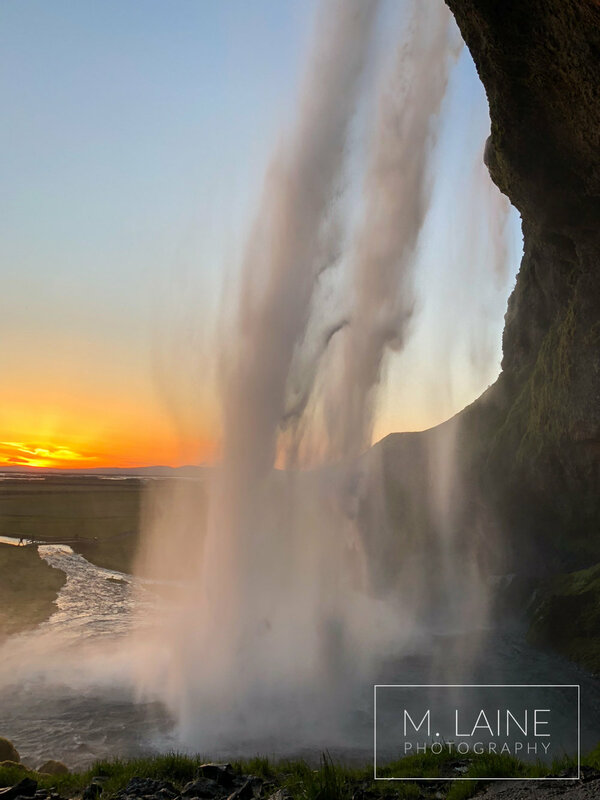 We visited Glugafoss (aptly named because of the sound it makes), Gljúfrabúi Waterfall, and saved Seljalandsfoss or last at sunset. Finally, we ended our trip with three days in Reykjavík. We toured the beautiful town, trying touristy things like eating fermented shark and street hotdogs, as well as going to local spots and markets. We learned that when locals say they’re going out late for the nightlife, they mean starting at 1:00 am, which is when bars get busy. Our favorite place was Bar Ananas, a tiki-themed bar that was “close enough” to tiki as it could be while being so far away geographically. We loved that they had live music from a DJ spinning vinyl records, even though music was generally great everywhere in Iceland. The Kíkí Queer Bar was our second favorite place, and it was by far the most popular place to hang out. On our last evening, we visited our first hot springs of the trip — the famous Blue Lagoon. It was glorious. Zach’s not a huge fan of hot tubs, but even he agreed that it was the perfect temperature, and we stayed for 3 hours. It was the best way to end our trip, and we’re a huge fan of hot springs now! All in all, Zach and I checked off an incredible place off our bucket list, but it only added more to the list. 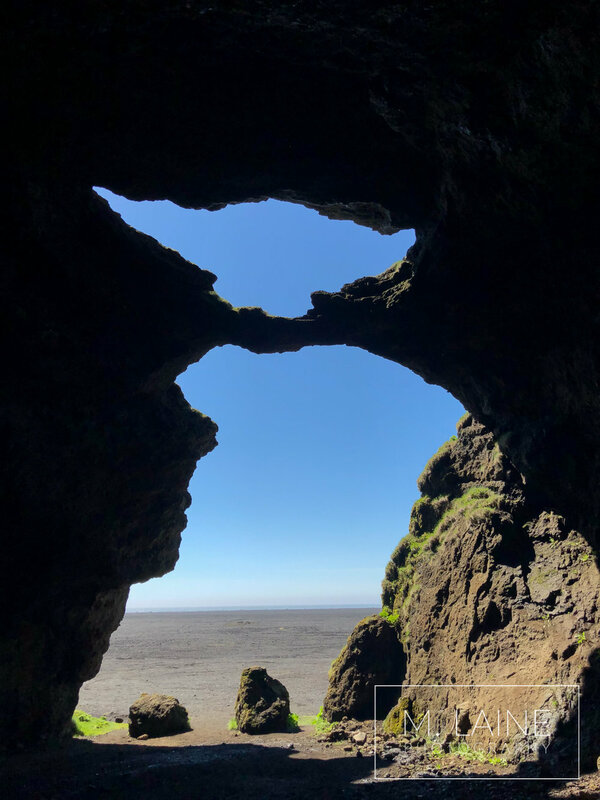 We can’t wait to go back in winter to explore ice caves and see the northern lights, and again in summer to hike in Landmanlauger, the Fjaðrárgljúfur Canyon, and Thórsmörk. 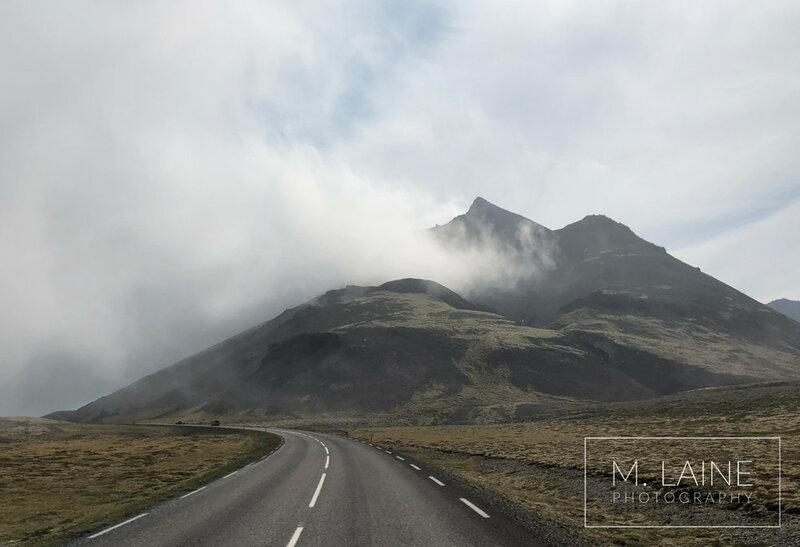 We didn’t even get a glimpse of the westfjords and want to dedicate another trip to that region alone. There is so much to see throughout Iceland, and despite traveling around most of the country, there is so much left for us to explore! We’ll definitely be back! 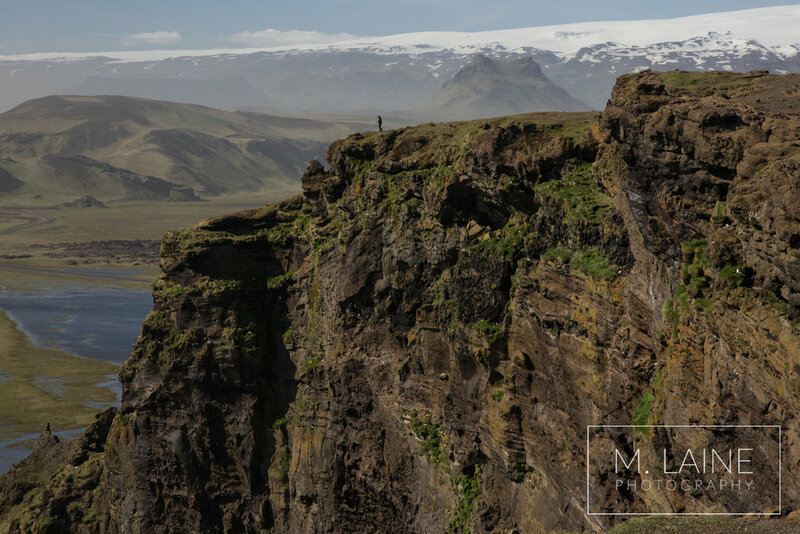 Check out my favorite elopement locations if you’re planning a destination wedding to Iceland. We visited in late May, which is the shoulder season. Peak season is June through August. You can expect more crowds in the peak season, but will also have access to more tours and national parks. We lucked out with beautiful weather and enjoyed most everything that we could have seen in the peak season, but with fewer crowds. Visiting the sights at odd times helps with crowds too, so take advantage of the jetlag and 24 hours of daylight during summer months. We loved everywhere we stayed throughout Iceland. The Fosshotels were convenient because most came with breakfast, but the guesthouses on local’s farms were so comfortable and fun. Whenever we do end up going back, I’d like to try out more guesthouses for our lodging. Buy all the car insurance possible! With gravel roads, potholes, and wind so strong that it can rip car doors off, you’ll need it. We were so thankful to have our windshield covered when the rental agency found a chip in ours. Be wary of opening your car doors, and park into the wind. No insurance covers a car door being ripped off. Also, only plan to park near beaches in decent weather, as the wind and sand can strip a car of its paint. Rent an SUV or 4x4 car that is capable of driving F-Roads without breaking your rental car contract. Some of the sights, like the Dryholaey Lighthouse can only be reached by a vehicle with higher clearance. Next time we visit, we’re going to splurge on what they call a Super Jeep so we can drive anywhere we please, including fording rivers, although that is not necessary to drive most places. Check road closures, especially if you’re traveling in winter, spring, or fall. We nearly didn’t get to see Dettifoss because of this! Map out your route prior to your trip and know where you’ll be able to get gas. Towns are far and few in between, so know where you’ll need to fill up if you’re traveling the northern region. Also, be sure to buy a gas card as many of the more remote stations are unmanned and charge exorbitant credit card fees. Be careful on beaches. Most Icelandic beaches have sneaker waves, which are undetectable until they crash upon the beach. Don’t turn your back on the ocean and go to the shore at your own risk. Respect Iceland’s land by staying on designated paths. Don’t step on their fragile moss (it’s taken thousands of years to grow), climb on the rocks fairies could live in or, or touch shipwrecks on beaches out of respect for fallen fishermen. There aren’t many barriers (fences, guardrails, or warning signs) put up in Iceland so when they do have them they really want you to respect that area. If there is a sign in an area with designated park hours, it’s probably because there are birds nesting in the area. Do not disturb them by visiting the area while it’s closed. Let me know if you have questions in the comments!